There are two ways to insure. First, take insurance policy as and when shipment is made. Those exporters, who make shipment now and then, do this. The second and common mode is to take open policy. Under open policy, the exporter does not have to take insurance contract, every time, as and when shipment is made. He pays insurance premium, in advance, and the policy is issued for the amount paid. The policy is, generally, issued for the period of one year. The insurance company undertakes to indemnify the insured up to the amount of the policy. Shipment of goods to the extent of the policy amount is covered. A brief declaration by the exporter about the basic facts of shipment would do. A great volume in exports business prefers this method for the following obvious advantages: (a) Exporter enjoys automatic and continuous protection. Even if there is delay in declaration or exporter has overlooked to submit declaration, the shipment is covered provided the delay and oversight are not intentional. 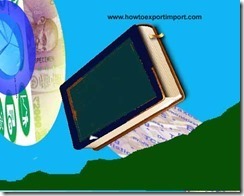 (c) Exporter will have prior knowledge of the premium amount and so exporter can quote competitive rate for his exports.